Tattoos with a flare! The tattoo is made entirely out of glitter. It’s a fun add-on to any event; it’s a huge hit with the crowd. Grab a tattoo and then show it off to your friends. 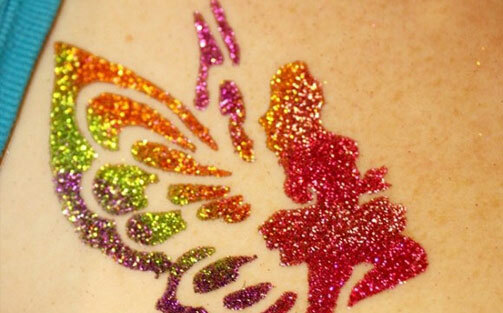 Add some color and a lot of glitter to your next event with glitter tattoos. We have dozens of designs that can change the look of not only your guests but your party altogether. All of the tattoos are kid friendly. The body glue is safe for the skin. Add a custom tattoo to make your event that much more special! Each tattoo is waterproof and can last up to a week.